I started out this year with one hive and one queen. Through splits and swarms and packages, I’m now up to seven queens for seven hives (brides for brothers?). Of the seven, two queens are home grown (raised from eggs of BnB1’s queen). All of them seem to be doing well at the moment. I’ve had a post in mind for a while about the queens. My friend, Julie, over at Happy Hour At The Top Bar recently made a couple of posts about her queens (and how to spot one in a picture) which prompts me to update you all on mine. Of the seven, there are 2 that I haven’t yet seen in person, but I can tell that they are doing well because those hives have eggs, larva and brood every time I look. See how many you can find in the pictures below. The queen in BnB1 came from the split from BnB2 and is the mother of the other 2 backyard hives (appropriately named BnB2 and BnB3). She’s been laying very well and after a slow start, the hive has been rocking the past two weeks building new comb and storing some honey. 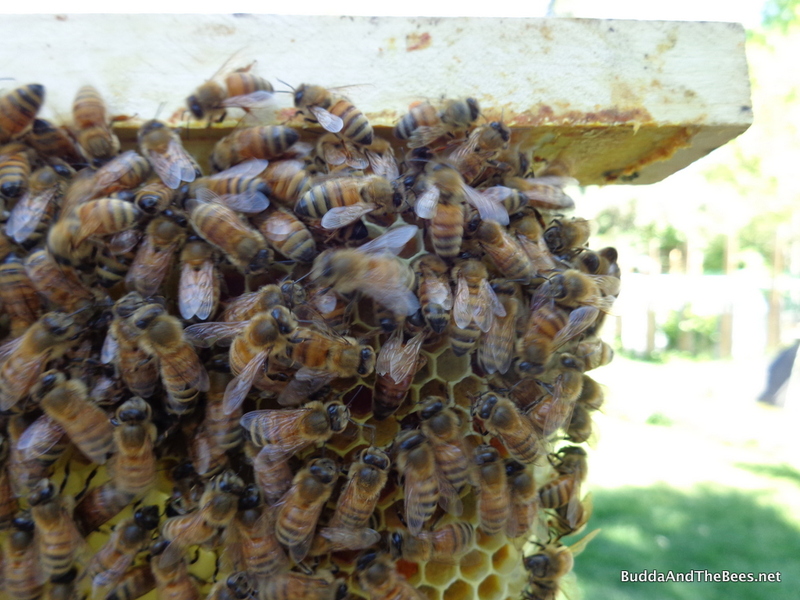 Queens love to lay on fresh comb and BnB1 took a while before making new comb because they had the older comb that was moved from BnB2. 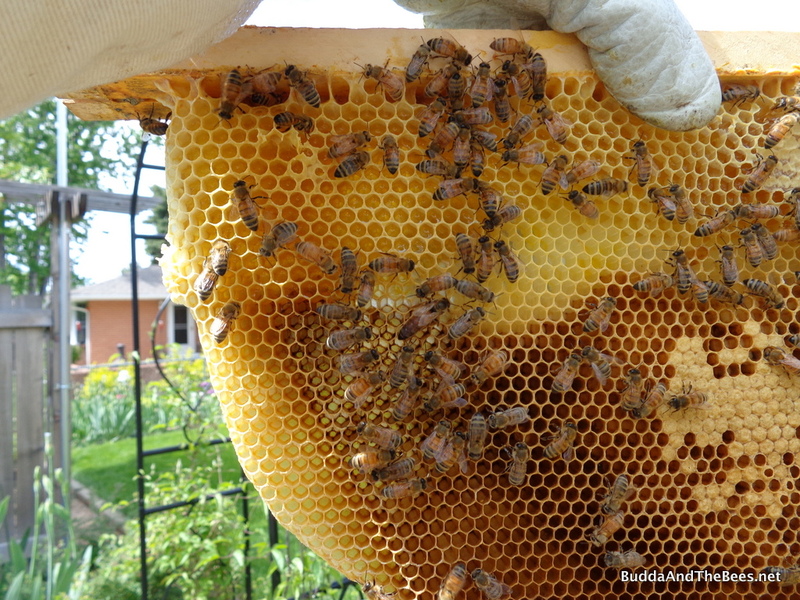 But eventually, they started building some lovely fresh white comb and she started laying eggs on it. Eggs look like little grains of rice at the bottom of each cell. Usually I have a hard time seeing them, but they showed up nicely on this new comb. 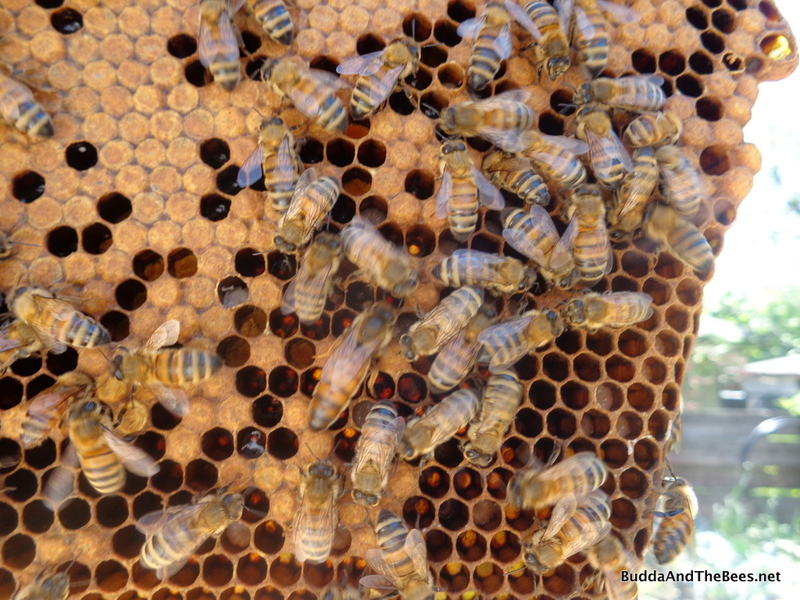 One thing about BnB1 is that two different colonies in here have made comb perpendicular to the bar. When I looked on Saturday, I found this new colony did it! Geez! I don’t know what that’s all about, but it can be a mess to clean up since it was loaded with fresh honey and nectar. After the split, this colony raised a bunch of queens and then swarmed with one of the virgins. Due to the weather, it took a long time for this queen to get mated and start laying. For a while there, I thought I was going to have to requeen. But, then there were signs of larva and capped brood, so I knew she was mated. But she wasn’t laying very well and I still thought I still might have to do some regicide. And, I could never find her. Also, this hive was loaded with drones that seemed to be eating up all the nectar so they weren’t making any honey. I peeked in last weekend and things seem to be right again. The drones seem to be gone (should have been about the end of their lifespan) and there was lots of capped brood so she wasn’t badly mated. And, I finally spotted her! I did some comb rearranging and gave them some empty comb in the brood area so they could make some fresh comb and start making honey. This is the swarm with one of the virgins from BnB2. Like her sister, it took a long time for her to get mated and start laying. But, they seem to be happy in their little nucleus hive. I find it interesting that they haven’t completely filled all the combs. Even the little tiny comb that Duncan and I found a couple of weeks ago is still just as small as it was then. But, there’s plenty of brood and bars of fresh honey and nectar, so they seem to be happy. 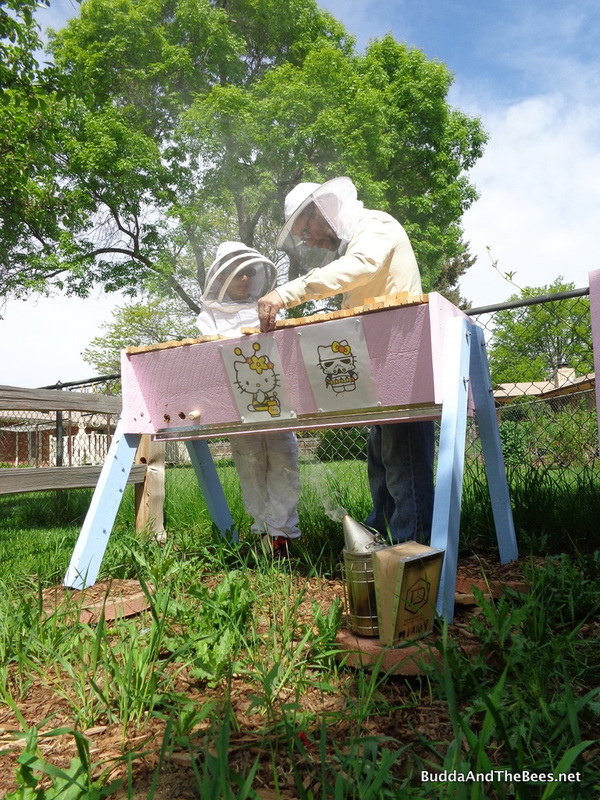 This is my first time tending a nuc, so maybe that’s just the way they are since they are limited in space. 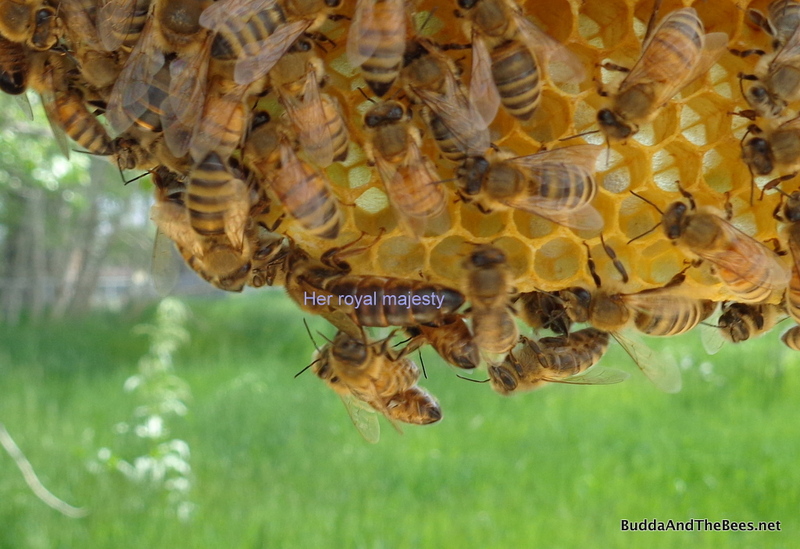 This queen remains elusive, though – I haven’t seen her yet. 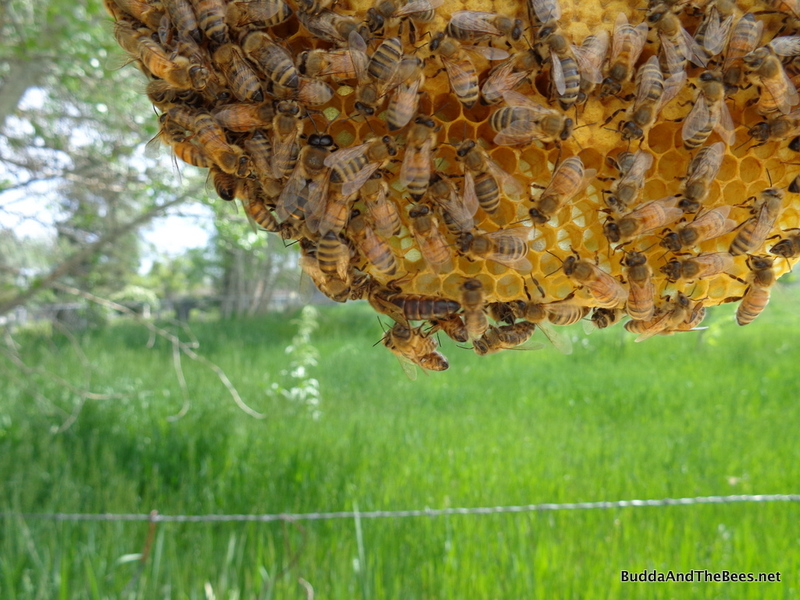 This hive has been rocking this year and the queen is quite prolific. Every time we’ve looked into the hive, the bars are full of brood. This Carnolian queen came from California with the packages (from C. F. Koehnen & Sons) and all the package queens seem to be good layers. 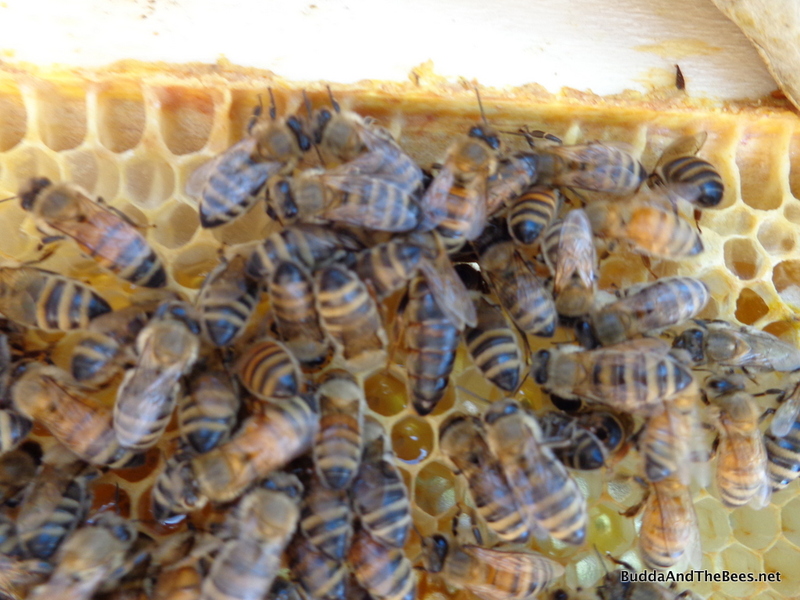 Duncan’s queen – black belly in the center of the picture. 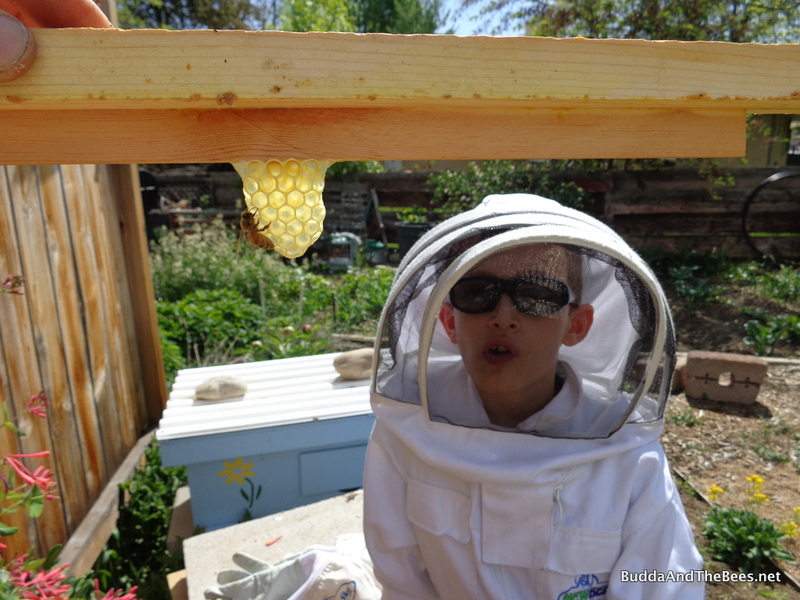 During one inspection, we watched a bee hatch out of her cell (center lower left in the video), while Duncan’s sisters looked on from nearby. 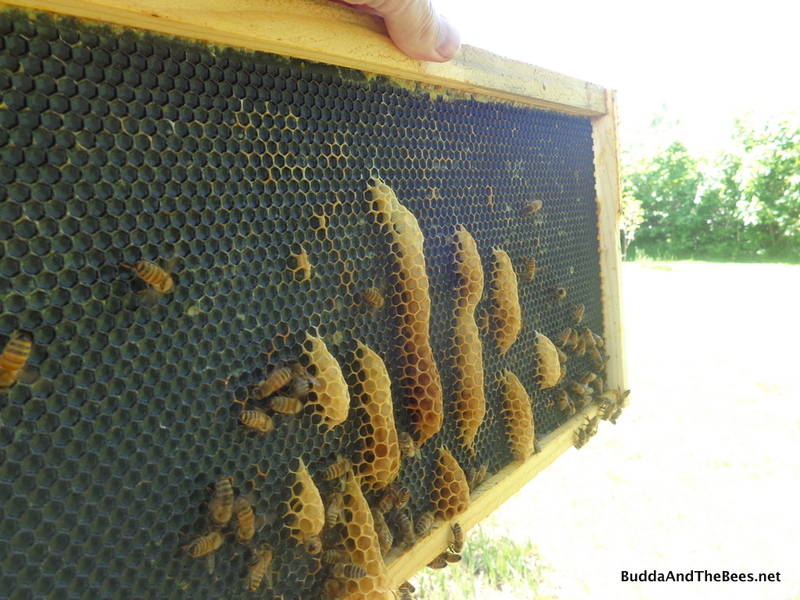 A few weeks ago, we moved the follower board back to give them some room to expand (4 bars) and they filled those with comb and brood in less than two weeks. After that, we just moved the follower board all the way to the back. We need to go in soon to make sure that they are building straight comb, but our schedules haven’t meshed. This was the second swarm I caught and they are pretty golden Italian bees. When we moved them into the larger hive, we caught a glimpse of her. She’s not as golden as I would have thought, but she makes pretty little offspring! The hive seems to be doing well. They hadn’t expanded much into the new space, and the queen laid lots of drones, so I moved the hatched drone comb to the back so they could fill it up with nectar. It’ll be time to look in again this weekend to see what they’ve accomplished in a couple of weeks. This package queen has also been fairly prolific although she laid a lot of drones early on also. I don’t worry about the drones in a full hive – if I take them out, they’ll just make more. In case you can’t pick her out, here’s a closeup. 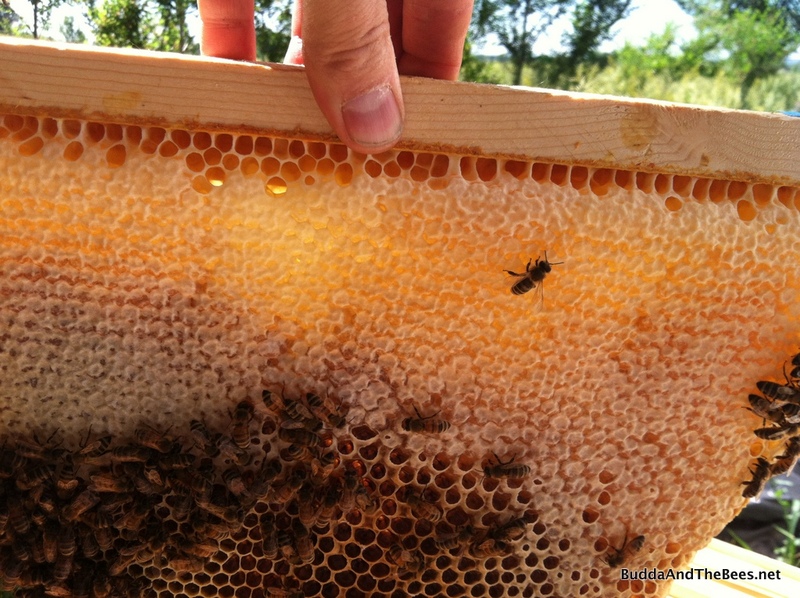 The workers have been drawing out new honey comb and are starting to fill it. I love finding fresh white comb with fresh white cappings. If they keep it up, we might have some honey to harvest from this one. I’m still trying to figure out how to work the Langstroth hive, but despite my incompetence, they seem to be flourishing. Initially, I left the feeders on too long and they built comb up between the two jars and had some larva in there. 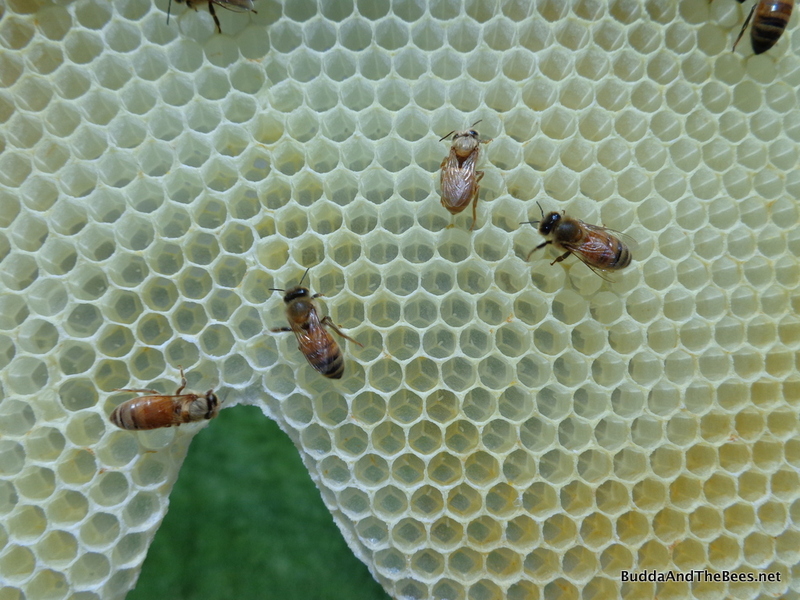 When I poked through the comb at home, I found 5 varroa mites. However, in subsequent inspections, there haven’t been many on the screened bottom board, so maybe they are taking care of them. 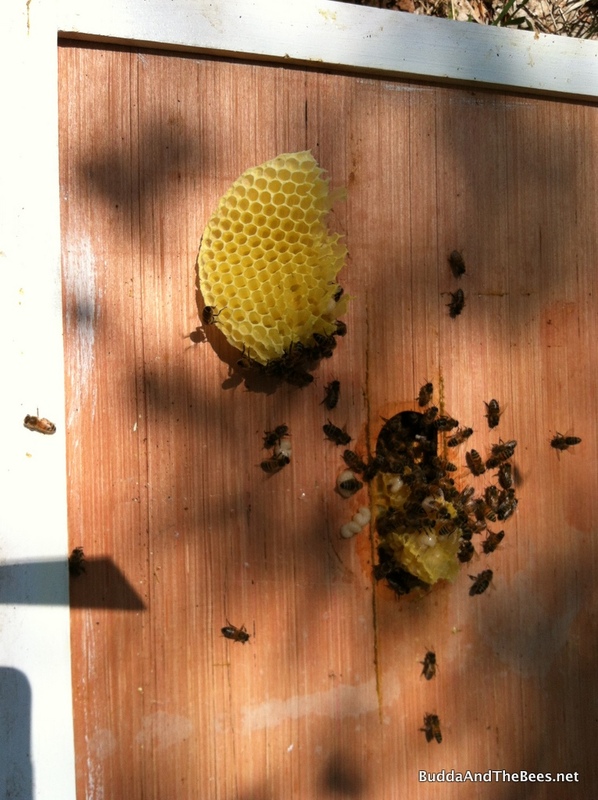 Comb from between feeders on Left Hand Hive – larva on the board. After removing the feeders, I put on a second box because the bottom box was about 80% full. On the next inspection, they had once again built a comb up from the bottom in the same spot. I removed any extraneous burr comb and they didn’t repeat that the next time I looked. The other problem with this hive is that I used old frames from the deadout that was there before. I took care to freeze them and clean them up a bit, but I think I probably should have scraped the foundation clean and rewaxed it because they keep building comb perpendicular to the foundation. Stupid bees going the wrong way! On the last inspection, I removed any frames like this and added in some frames that I got from Laura’s Langstroth. On a couple, I took out the foundation and added a strip at the top to see what kind of comb they will build (worker, drone, or honey). Eventually, I’d like to go all foundationless. 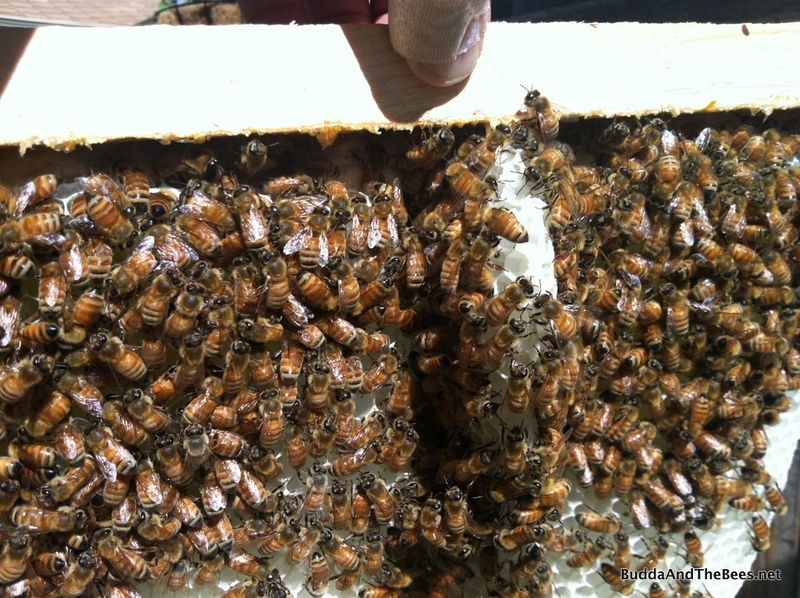 It should be just like managing a top bar hive – more frequent inspections to make sure the comb is straight! I need to have some built out comb to put the foundationless frames in between so they will draw the comb straight, so it will be a slow transition. I haven’t seen this queen in person yet, but she has been laying pretty well and the hive is burgeoning. I’ll try to get over there this weekend and add a medium super for honey if they’ve filled out most of the second box. Congratulations on all the hives being queenright! That freshly capped honey looks amazing, too. That’s so weird seeing the bees build perpendicular to the foundation. Is that plastic foundation? I’ve heard that bees frequently do weird stuff on plastic. Is there anyway to fix plastic foundation after the bees have built all wonky on it? You mentioned scraping and rewaxing it. Since I don’t know that much about foundation, I’m curious about that process. Is the plastic really sturdy so that scraping doesn’t damage the honey comb impression? How do you rewax it? Is it as easy as just brushing on some melted wax? Anyway, this was a great post. So many gorgeous photos! It is plastic foundation which seems to be very popular when you order kits which is what these came from. After seeing that wonky comb, I started googling around and found that if there is no wax on the plastic, that’s what they tend to do. I found some info on how to rewax (like using a 3″ paint roller), but not a really good one on how to dewax (but I haven’t looked to0 closely yet), so I’m not sure on how I’m going to do that. The foundation is pretty sturdy, but I’d rather just go foundationless. For the deeps, I have enough built out comb that I can put empty frames in between, but I only have one new (medium) honey super (so far) and it came with all plastic foundation. Except on one frame, they left out the foundation, so I’m going to set that up for them to build there own comb! It will be interesting to see whether they’ve build straight comb on the empty frames I put in, or weather it’s a giant cross-comb mess! I was looking at some videos on YouTube for cleaning plastic frames, and it looks like a pain. I can totally understand why you’d rather go foundationless. I keep hearing Lang people say that TBHs are difficult, but compared to Langs, they seem less work to me. Yes, there are more inspections (which is the fun part anyway), but there is less work done outside the hive — Lang people always seem to be building more boxes, more frames, stringing more foundation, storing equipment, etc. I totally agree with you on the work, storage, etc for TBH vs. Langstroth, plus there’s the expense! It cost me almost $60 for a medium super with 10 frames and foundation. I can build 2 top bar hives for that and I don’t need no fancy dado cuts! I’ll have to do an experiment to see if the plastic foundation would melt in my solar wax melter, and if not, that may be a way to clean them. But generally, it’s probably easier just to buy new foundation if I need it. What a racket! You can get perpendicular comb in Langstroth hives if the hive isn’t level. Spraying the bare foundation with sugar syrup, perhaps spiked with anise, can get the bees working on it too. Thanks for the tips. The hive is level (years of TBH experience), so I don’t think that’s it, but a good thing to keep in mind. I’ve seen some Langs tilting so badly, it puts my OCD into high gear when I see it! The sugar water sounds easier than rolling on new wax. What does the anise do (vs other essential oils)? I’m not sure anise is any better or worse than other essential oils. It’s just the one I’ve used with all my sugar syrup since I started. Gets the bees digging into it quicker.